In doing this BellHawk tracks what materials were consumed, produced and returned from each operation. It tracks the lot numbers and suppliers of materials used to make or process other materials as well as the equipment and people's time used in the processing step. It also tracks scrap, rework and byproducts as well as problem reason codes. 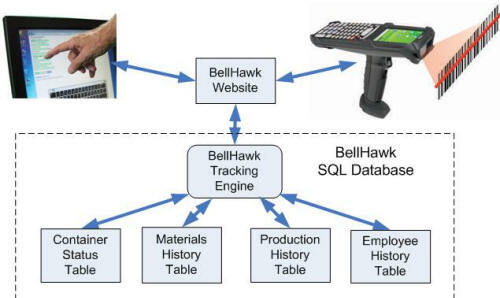 Based on inputs from data collection PCs and mobile computers, BellHawk tracks the real-time status of all containers of inventory and work-in-process, as well as individually barcoded items and assemblies. This includes tracking information such as their current quality assurance status, expiration date, and whether they are or contain hazardous materials. It also includes who supplied or made the material, who it belongs to, and what customer or project it is assigned to as well as tracking lot numbers and serial numbers and quantities in multiple units of measure. BellHawk also builds a complete time tagged history of all the actions that happened to each container of material as well as its processing history. It also maintains an employee history of who was working on what and when and what equipment or machinery they were using. From this data, BellHawk can show managers, supervisors and other employees the real-time status of materials including those that relate to specific customer orders. This helps ensure that customer orders get processed and shipped on-time. The history data can be used for performance analysis as well as for finding and preventing operational problems. It can be used as the basis for finding the source of defects or contamination and for minimizing recalls of material. It can also be used for detailed cost analysis by operation, product, manufacturing order, machine or employee. This data is available through a number of standard reports or Excel exports from BellHawk. As BellHawk uses a standard SQL database, this data is readily accessible using a wide variety of standard reporting tools for producing custom reports. Please click here for more details of the Capabilities of the BellHawk Software.